Founded in 1987, Adventure Canada was created to bring travellers to Canada's "blank spaces", those areas whose remoteness alone made them special. Over the last fifteen years, along with our guests, we have discovered that there is so much that is extraordinary about the places we travel, from the landscape, wildlife and culture to the history, art and archeology that is unique to every destination. It is our belief that there is so much to see “beyond the binoculars” that drives us to delve deeper into our favourite places with every expedition and continually seek out new destinations. We travel by small expedition ship, the best suited mode of transportation for remote exploration. The number of passengers on our voyages run between 45 and 100, depending on the ship we choose. We believe that these small vessels are superior, as they not only allow us to gain access to places not accessible by larger vessels, but our fleet of Zodiac landing craft permit us to visit some of the most remote places imaginable - the key to expeditionary travel. 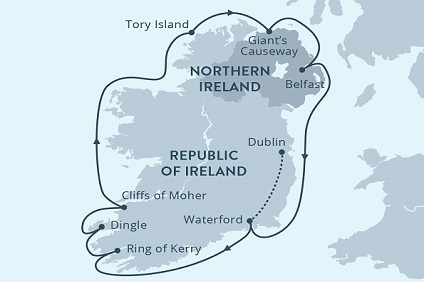 11 Night Cruise sailing from Dublin roundtrip aboard Ocean Endeavour. 10 Night Cruise sailing from Oban to Aberdeen aboard Ocean Endeavour. 9 Night Cruise sailing from Reykjavik roundtrip aboard Ocean Endeavour. 11 Night Cruise sailing from Reykjavik to Kangerlussuaq aboard Ocean Endeavour. 11 Night Cruise sailing from Resolute to Kangerlussuaq aboard Ocean Endeavour. 16 Night Cruise sailing from Kangerlussuaq to Kugluktuk aboard Ocean Endeavour. 16 Night Cruise sailing from Kugluktuk to Kangerlussuaq aboard Ocean Endeavour. 14 Night Cruise sailing from Kangerlussuaq to St Johns aboard Ocean Endeavour. 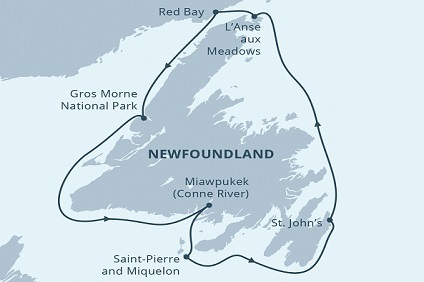 11 Night Cruise sailing from St Pierre to St Johns aboard Ocean Endeavour. Dining onboard Sea Adventurer is the excellent cuisine. Using the freshest of ingredients possible — seafood, fruits, vegetables — they prepare each meal from scratch, just as one would expect in a small gourmet restaurant ashore. They offer a variety of choices at each meal. Each dish is individually cooked to order. And passengers enjoy single leisurely open seatings, providing opportunities to make new friends. Special dietary requirements such as vegetarian, low-fat, etc., may be arranged.